There are many ways to roll your own cigars. The information on this page tells you how I roll my own cigars. You don't have to follow my methods, but you may find my methods are easier and cheaper than other methods, yet give good quality cigars. Remember, practice makes perfect, so give it a go and keep trying. As a quick tip, don't try doing this job in high winds or indoors, it makes a lot of mess, and after 40 years of marriage I have learnt how to avoid conflict! As a famous British cook once said about 'how to cook rabbit stew', "First catch your rabbit". The same applies to making cigars, first grow and cure your tobacco. Growing tobacco has been well documented on other pages on the site, so we will concentrate on manufacturing a cigar. You don't have to blend your tobacco exactly the same as I have. This is only a guide based on my experience and my tastes, so experiment and enjoy it. You will also need a former for the size of the cigar you wish to make. The former is used to retain the shape of the cigars while you dry the tobacco. 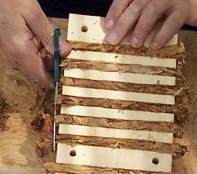 The easiest way to make a former is to nail strips of timber onto a piece of board. For small cigars, use narrow strips of timber. For larger cigars, use larger strips. Use another piece of the same timber to space the strips. 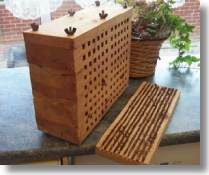 The multi-story cigar block or former shown on the right measures about 12 inches high by 15 inches wide and about 6 inches deep and holds 120 cigars. It was built to fit inside my oven (see below), so if you want to build a big cigar block, bear the size of your oven in mind. The lower single piece of wood is for smaller cigars, which I cut to length. I have other size blockers for different size cigars. Cigars will round off a little from the square shape when you put the outer wrapper on. Shredded tobacco makes a neat job of your cigar filler. If you only have a small amount of tobacco to shred, try cutting it finely with a pair of sharp scissors. For larger amounts you can try a food shredder like the one shown in the picture. This cost me less than £10 / $15 and works well on semi-dry tobacco leaf. You will need to lightly water spray the shredded tobacco when you use it for a filler. You don't need to shred your tobacco, you can use whole leaves for larger cigars. Gather your leaves and draw them through your hands to remove any folds. This will allow air to pass through the leaves unobstructed. You now need to prepare your binder leaf. It's preferable to use a Havana leaf for the binders as Havana is thicker and stronger than other leaves. Remove the mid-rib with a knife or a pair of sharp scissors. Keep your binder leaf moist and flexible while doing this to prevent it cracking. If you do not have a large enough leaf due to the size of the cigar then use two leaves. Lay your shredded tobacco on the binder leaf as shown in the picture. The amount of filler that goes in your binder is a matter of practice; too full and you will not get air through the cigar, too loose and it will burn too quickly and too hot. You will need to glue the binder leaf to hold it in place around the shredded tobacco. You could use Tragacanth or Guar Gum if you have them, but as these are relatively expensive and not easy to get hold of, you can use egg white. Spread some glue along one edge of the binder leaf. You won't need any more than that. Roll the leaf round the filler and place in your former as per the photograph. You don't need to be very neat at this stage as the former will create the cigars shape. Trim off excess leaf at this stage, as it will be very brittle when it has been dried out. Now put your former into the oven on a moderate heat to dry your cigars. 30 - 45 minutes on a temperature just warm enough to warm plates should be fine. Use a thin tobacco leaf for the wrapper (that's the outside covering). Monte Calm Yellow is good; it handles well and has a smoother texture than the other types. You may also like to smooth out the wrapper leaf prior to rolling it by pressing it with a warm iron as this will give a smoother finish. First trim off the centre rib or stems with a pair of scissors or blade, at all times ensure the leaf is flexible and not dry. Cut out a rectangle and lay this strip diagonally from left to right as in the picture to the right. Ensure the fine ribs in the leaf are vertical (going away from you). The vein ribs are more pronounced on the underside of the leaf, so, have the underside uppermost so the veins are hidden when the cigar is made. This will give a smoother finish to your cigar. Use a small amount of glue (egg white, tragacanth, guar gum etc) along the edge of the wrapper. Now roll your cigar away from you, leaving an overlap at the left hand edge. Your option now is do you close off the ends or leave them open. Covering the end of the cigar with the leaf can be messy; think, how often do you buy a cigar that needs the end cut away? Not often. The solution is to overlap the ends when putting the wrapper on, and trim off when dry. Only practice will close off the ends of your cigar, I have yet to succeed in producing a finish I am proud of, but then I am rubbish at wrapping a parcel! You can see my finished cigar in the picture to the right. Will I ever smoke a cigar of this size? I might have 30 years ago when my lungs were operating at full steam. At the finished state of manufacturing you first cigar, you will be tempted to light up. Don't, it will be too dry. Store your cigars for a few weeks to allow the cigar to absorb moisture from your home. I find the lounge or living room to be ideal as the humidity is around 22 - 25%, where as your kitchen could be as high as 60%. Storage of cigars is normally in cedar wood boxes known as humidors. These can often be picked up second hand from car boot sales or second hand shops. Keep your cigars in your living room. A cigar will improve and mellow over the years. The shop shelf life of a cigar is 7 years, but if your cigars are kept at around 22% humidity, they will keep for many more years. Making cigars is fairly easy. Making good cigars that smoke well takes a bit of practice. Don't be put off if your first attempts don't work out too well. Keep trying. If you follow my advice, you can't go far wrong. I'll give a few more tips for rolling your own cigars. If your cigars are too dry, store them in the kitchen for a few days to absorb more moisture. This should result in a smoother smoke. If you can't draw air or smoke through the cigar then you have rolled them too tightly. You could try a strip of wire in the middle of the cigar at the filler stage, then removed this when the cigar is finished. Better still put less filler in. If your cigar tastes too strong then you need to let your cigar mellow. Most cigarette tobacco leaf is stored for two years after curing to mellow the leaf. In the case of cigars this mellowing can take place after it is made, so be patient. You can also change the blend in your next batch of cigars to make milder cigars. If you have trouble putting the wrapper or binder leaf on your cigar, ensure your tobacco leaf is moist, not dry and not wet. The leaf should be flexible, not brittle. To get your tobacco leaf flexible, spray it with warm water and place it in a plastic bag until it becomes flexible. Always work on a flat surface. Don't try to put your cigar with the wrapper leaf back in the former as it will be too big. I have never found a need to flavour my cigars, but I have been told that placing a small strip of fig leaf in the filler vastly improved the flavour.